Ramblings and rantings about kids, food and life. I haven't worn anti-perspirant for at least a couple of years, mainly because of all the health concerns that comes with wearning an anti-perspirant. Just do a quick search on The Environmental Working Group's Skin Deep Cosmetic Database and learn more about the dangerous ingredients used in the severely under-regulated cosmetic industry. My old brand's label shamefully reads: "Ask doctor before use if you have kidney disease." I don't think one should have to consult a medical professional on their deodorant/anti-perspirant choices. Besides, your body was designed to sweat out toxins; why block a main outlet for the toxins to exit your body? I don't like the idea of using chemicals to get my body to stop sweating. Since I've shunned anti-perspirants, my only option has been deodorant, which only masks the stink. I've been using a great brand, Kiss My Face - Peaceful Patchouli , for at least a year now and have been very happy with it. However, I love homemade recipes for common cosmetic products. I came across a great one from my friend's blog: Homemade Dutch Apple Pie. Since it's going to be in the 90s all week here, I thought it'd be a good time to try out this recipe. Mix baking soda and corn starch in a bowl. Add coconut oil and combine, then add your essential oil. Press into an old deodorant container. To use, hold against skin and allow for the mixture to soften a bit before applying. It's recommended that you also use your hand to spread it around your entire pit. **UPDATE** I wasn't unable to get my mixture to set properly into a deororant container, so I scooped it out and put it in a glass jar. I took about 1/2 teaspoon out with my fingers and spread it around. It was in the upper 80s here yesterday with very high humidity (felt like 99 degrees out!) and this stuff held up very well. What's your favorite homemade cosmetic recipe? 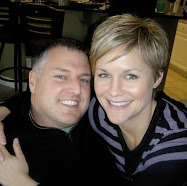 A friend recommended a fabulous blog to me, called Heather Eats Almond Butter. On the site was a recipe for coconut butter. I've been using coconut oil for a few years now (one brand I like is Nutiva Organic Extra Virgin Coconut Oil) , but I've never heard of coconut butter. I have read that it can cost upwards of $15 depending on where you live. I use it as a facial/body moisturizer and in my cooking. Two of my kids' favorites are on popcorn and in place of butter while making grilled cheese (it gives it a slightly sweet flavor). Solid at room temperature but with a low melting temperature, coconut oil is primarily a saturated fat. However, it contains medium chain fatty acids and is considered one of the good fats. I usually just use the coconut oil straight from the jar. This coconut butter recipe from Heather Eats Almond Butter uses finely shredded coconut. I found some organic shredded coconut from Harvest Health Foods for $3.50/lb. Take approximately 12 oz. of organic shredded coconut and place in a food processor. You'll need to process it for about 15 minutes to make sure you really get all the oils out of the shreds - it will basically liquify. Pour into glass container and let set at room temperature. No refrigeration necessary. Check out Heather's Web site for variations on coconut butter, including Chocolate Coconut Butter. I'm currently doing a three-day raw food diet with my mom. I eat fairly healthy (on most days), but every once in a while, I can tell that my system has been overtaxed by the foods I eat (Friday Family Pizza Night, anyone? ), the environment I live in and the natural stressors in my life. I'm on day two right now and have drank my breakfast for the past two mornings. I find that it keeps me full and peps me up a bit more than the heavier granola or whole food bar that I usually eat. This is a very basic recipe that I used for this juice, which changes each time I make it. I've had a Breville juicer for just about a year now and I really love it. Easy clean-up and massive juicing power. Here's a re-print of an article I did for Natural Awakenings - West Michigan magazine in April 2009. School lunches have gotten a bad rap, and rightfully so! But in many cases it's not through lack of effort or passion - it's through lack of money. The photo here is from Countryside Elementary (Byron Center Public Schools). Every elementary school has a full-service salad bar in the lunch room, and makes an effort to serve healthy food within their budget. It doesn’t sound like your typical school hot lunch fare: a Michigan cherry burger on a wholegrain bun, roasted asparagus, mixed fruit shortcake on an Awrey’s Biscuit and Peterson Farms apple slices, but it is what Byron Center Public Schools (BCPS) will be serving up to its students during Michigan Week, held May 17-21. These are just a few of the spotlighted local items on the BCPS hot lunch menu, which coincides with the National Farm to Cafeteria Conference in Detroit during the same week. Although the Kent County school already features as many locally sourced items as budget and time allow, this is the first year that they are publicly highlighting and featuring them for all to see. Susan Meyer, Food Services Director for BCPS for the past 10 years, said that the school lunch program gets a worse rap than what they deserve. The marketing committee from this group began working with Gordon Food Service to come up with products for the schools to choose from. They gave each district a template from which they could choose some or all items to feature on their menu. Although the menu sounds basic enough, it’s not an easy thing to pull off in an oftentimes underequipped school kitchen. Meyer, who has trained in culinary arts and has owned her own wedding and catering business, firmly believes in cooking foods in a healthful manner and preferably from scratch. Based on the national average for producing a lunch, BCPS and other public schools across the nation gets reimbursed up to $2.68 for free or reduced priced lunches served, which includes labor. Districts also receive $.25 per full-priced meal served to help offset food and labor costs. This could be a big deal, especially at the high school, where there are over 20 lunch choices for the students. BCPS hasn’t raised prices of its lunches in four years, and depending on the budget the school may have to revisit the subject in the near future. If parents asked for more made-from-scratch and non-processed foods with the understanding that the cost would be higher for lunch, Meyer could take it to the BCPS Board of Education and raise prices with the School Board's approval. Research has shown that introducing just one low-fat plant-based meal a week can begin to correct a child’s poor nutrition. Since 2050 students take hot lunch each day at BCPS, this could make a significant difference in the health of the community. Luckily BCPS is ahead of the curve. There’s a full salad bar at every school, including all elementary schools and it’s been a non-carbonated beverage school for the past seven years. It’s also one of only two schools in Kent County that does not have a contract with Coca-Cola. Even so, more changes do need to be made and she believes that everyone can begin to work in a more positive direction with what they already have. My family loves pesto. In the past, I've bought the Kirkland brand of pesto from Costco, which was pretty good and decent in price. This summer, I've decided to make my own pesto from the basil from my garden. My husband's co-worker sent me this recipe, which I was hesitant to try at first because it contained heavy cream, but oh my ... it's really good. I served this on toasted cibatta bread with grilled chicken, mozzarella, paremesan and fresh lettuce. Later in the week, I made some quinoa and used the leftover pesto as a sauce. It was fantastic! Put everything in a food processor and mix until you have a sauce thickness to your liking. Pour sauce into saucepan and heat until it's warmed through. While the sauce is heating, whip the heavy cream. Add 1 to 4 tablespoons of the cream to the sauce, depending on your taste (I used about 2 tablespoons). The sauce should remain somewhat thick. Add to your favorite al dente pasta, toasted cibatta bread sandwiches, quinoa. Another great dish with pesto is cooked penne pasta, and lightly steamed veggies like broccoli, asparagus, shallots, carrots ... and whatever other favorite veggies you have on hand. Enjoy! I usually don't post two days in a row, but I had to share this stupidly simple recipe for kale chips. I used the kale that I'm growing in my garden for the first time. This healthy snack was gobbled up by my kids and me within 15 minutes. If you can, use organic kale. It's number eight on the Dirty Dozen list for pestacide use. Preheat the oven to 350. Take one head of kale and remove leaves. Wash and dry thoroughly. In a large bowl, massage kale leaves with 2 to 3 tablespoons of olive oil. Season lightly with sea salt and spread out in one layer on a baking sheet lined with foil. Bake in oven for 20-30 minutes, or until crisp. Remove from oven and let cool completely. The final result is a very light and crispy chip that tastes incredible. Be careful, though, the chips can be messy because of how flaky they are. My kids ate these straight off the cooled baking sheet and asked for more right away. We'll be having fun this summer experiementing with different flavors, like adding nutritional yeast, tahini, soy, chipotle, cajun, etc. Enjoy! My husband and I are big fans of tortilla soup. I've tried to make it several times, but it never seemed to taste right. I finally found the winning recipe that my mom emailed me from a book called The 30-Minute Vegan: Over 175 Quick, Delicious, and Healthy Recipes for Everyday Cooking . Even if you're not vegan, there are plenty of flavorful and adaptable recipes that the whole family will love. For example, I add cooked chicken and shredded cheese to my husband's bowl to round his meal out. I've made it several times since the first try and it's always been a hit with the whole family. It also freezes well. I make two batches at a time to make sure I have plenty on hand. In a medium size pot, sauté the olive oil, onion, Anaheim pepper and garlic over medium heat for 3 to 4 minutes, or until the onions are translucent. Add the tomatoes, beans, chili powder, cumin, water and soy sauce. Cover and allow it to simmer for 10 minutes or so while you prepare the avocado and cilantro. Ladle the soup into bowls and top with a handful of tortillas and a sprinkling of avocado and cilantro. Since the weather has warmed up, I've curiously found my appetite waning a bit. Curiously because I have a huge appetite and usually have food on my mind during most of my waking moments. A couple of weeks ago, I had ordered some patio garden containers from VP Farms on 76th Street, and when I went to pick them up, I also bought a couple of heirloom tomatoes and fresh Michigan asparagus. 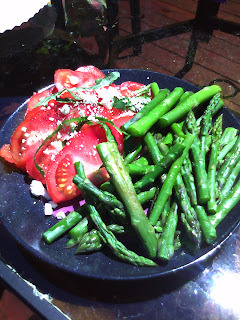 They looked too good to sit on my countertop, so I sliced up the tomato and steamed the asparagus. My patio pots contained, among many other things, three gorgeous basil plants, so I plucked off a few leaves and sliced those up. A drizzle of olive oil, a few turns of freshly cracked pepper and a sprinkle of feta cheese, and I had a very filling and simple - yet light - lunch. My garden is now complete. I have four pots of lettuce (pictures coming soon), one large tomato pot, one pot of just basil (fresh pesto, anyone?? ), and a pot of cilantro, parsley and oregano. In the ground I have broccoli, collard greens, melon, beans, kale, cucumbers and snow peas. I have no idea what I'm doing with any of them, so we shall see what happens. I love sandwiches, and grilled sandwiches are some of my favorites. Here's a very simple recipe for a grilled pesto and parmesan sandwich that can be made in minutes. Slather on the coconut oil and assemble sandwich, leaving out the lettuce. Place on griddle pan until the bread is browned on both sides. Add lettuce to the grilled sandwich and enjoy! Spring is just around the corner! That means local farmers markets, roadside produce stands and greenhouses are going to start popping up all over the place. This is my favorite time of year! One such place that opened a couple of weeks ago is VP Farms on 76th Street in Caledonia. Local home of the Vertical Garden Kit, VP Farms focuses on proving fresh fruits and vegetables as well as helping people grow their own using innovative methods of growing. Since they also supply local restaurants with their produce, including The Green Well Gastro Pub and Bisto Bella Vita, picking up some fresh lettuce to make my favorite simple go-to salad from them is always a good bet. Mix together and enjoy! This is a very versatile salad, and you can pretty much throw anything in there that you want. I've added: avocado, grilled tilapia, dulse flakes, sugar peas, red pepper slices, chicken - the possibilties are endless. I'm a married mom of two young kids trying to feed and raise them well. Subscribe To Our Lunch Box!